This decorative bridge will be the focal point of your yard. It can stand alone or be decorated with kids. Holds four planter liners, two on each end. The bridge looks spectacular whether or not you install a pond. Bridge can be built from standard 3/4" stock. 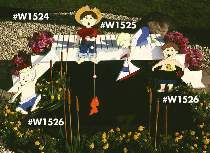 Meaures 19"H x 16"W x 80"L. Order patterns for the Boys on the Bridge and the Boys by the Pond separately below.